ঠিক তাই, রব্বানিও বললো। আপনারা দীর্ঘ সফরে নিশ্চয় ক্লান্ত। তাই শুয়ে পড়ুন। আমি ফজরের আজান হলে আপনাদের উঠিয়ে দেবো। নামাজের পরই আমরা গিয়ে পৌঁছাব হযরতজীর আস্তানায়। আমার কিছু এবাদত বাকি আছে। সেটা শেষ করে আমিও শুয়ে পড়বো। শুভরাত্রি জানিয়ে বিদায় নিলেন খালেদ ভাই। আধ্যাত্মিক রহস্য বোঝার মতো জ্ঞান আমাদের নেই, তবুও হযরতজী আমাদের সাথে সাক্ষাৎকরার সিদ্ধান্ত নেয়ায় আল্লাহ্‌ পাকের শুকরিয়া আদায় করে প্রশান্ত চিত্তে বিছানায় গা এলিয়ে দিলাম। সকালে ফজরের আজানের আগেই খালেদ ভাই এসে জাগিয়ে দিলেন। খালেদ ভাই বললেন, হযরতজীর হুকুম এসেছে নাস্তা তার ওখানেই করতে হবে। এটাও একটা অস্বাভাবিক ব্যতিক্রম দর্শনার্থীদের জন্য।সবি আল্লাহ্‌পাকের ইচ্ছা! আমরা তৈরি হয়ে নিলাম। যথাসময়ে পৌঁছালাম হযরতজীর বাসায়। ফজরের ওয়াক্ত, শহর এখনো জেগে ওঠেনি। রাস্তাঘাট ফাঁকা। একটা গলির ভেতরে প্রাচীর ঘেরাএকতলা বাড়ি, বসার ঘরটার মেঝে কার্পেট দিয়ে মোড়া। ঘরের মাঝখানে একটি খাটিয়াতে বসে আছেন হযরতজী। হাড়কাঁপানো ঠান্ডায় একটা ধোতি পরে খালি গায়ে বসে আছেন লম্বা সুঠামদেহী সাদা দাড়িতে মুখায়বব ঢাকা সুশ্রী এক জ্যোতির্ময় মহাপুরুষ, কাঁধে সাদা পাগড়িটা রাখা। দেখে বয়েস কতো বোঝার উপায় নেই। মাথার চুল খুবই ছোট করে ছাঁটা। এই শীতেও তিনি অনবরত ঘামছেন আর কাঁধের পাগড়ির কাপড়টা দিয়ে মুছে নিচ্ছেন শরীর কিছুক্ষণ পর পর। এর আগে এই ধরনের কোনও সূফি সাধকের সংস্পর্শে আসার সুযোগ হয়নি। আমরা খালেদ ভাইকে সব ব্যাপারে অনুসরণ করে চলেছি। ঘরে ঢুকেই আমরা মেঝেতে বিছানো কার্পেটের উপর বসে পড়লাম। অর্ধনিমীলিত চোখে ধ্যানস্থ অবস্থায় বসে আছেন হযরতজী। কিছুক্ষণ পর হযরতজী আমাদের দিকে চাইলেন। His bright beaming eyes were absolutely piercing! খালেদ ভাই অত্যন্ত আদবের সাথে তার কাছে গিয়ে নিচু স্বরে আমাদের পরিচয় জানালেন। রব্বানির পরনে সালওয়ার কামিজ আর আমার পরনে পায়জামা-কুর্তা। দু’জনই উপরে চাদর জড়িয়ে নিয়েছিলাম। এতো নিচু স্বরে তারা কথা বলছিলেনযার কিছুই আমরা শুনতে পারছিলাম না। সব শুনে তিনি আমাকে ইশারায় কাছে ডেকে নিয়ে খাটিয়াতে তার পাশে বসিয়ে ডান হাত দিয়ে আমাকে জড়িয়ে ধরলেন। খালেদ ভাই তার পায়ের কাছে বসে রব্বানিকে তার পাশে বসতে ইশারা করলেন।আমার কাঁধে হাত রেখেইহযরতজী সস্নেহে জিজ্ঞেস করলেন- তোমার কেনো এসেছো? Right from the beginning Gen. Zia never took any initiative to organize BNP as a political party based on any ideals or ideology. It is easy to create a bunch of ‘Yes men’ picking up some stray self seeking oppurtunists opening gate of rampant corruption being saddled in power but it is never possible to organize a powerful political party. As a result immediately after the demise of Gen. Zia the power struggle and devisive in fighting between the vested interested groups within the party was getting intense with every passing day from the top to grass root level every where. The complexity of the situation went out of control of the ailing ealderly leader President Justice Sattar. This presented the opportunity to powerfull Gen. Ershad to force the ailing leader who was then admitted in the CMH to resign and usurped the state power himself. Soon after Gen. Ershad took over he ordered to siege all bank accounts of BNP. After this political activities of BNP virtually came to stand still. At that pathetic situation the rat race started among the leaders of BNP to jump on the band wagon of Jatiyo Party(JP) announced by Gen. Ershad. Thus, BNP was nearly getting extinct. 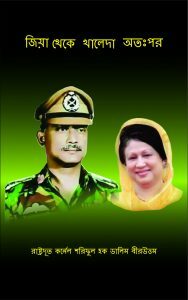 At that critical juncture, using the good offices of Gen. Nurul Islam Shishu, a few senior leaders, some young selfless dedicted leaders and workers of Chatra Dal and Jubo Dal with lot of difficulties some how managed to convince Khaleda Zia, the house wife to become the party Chair Person. This saved the party and also created opportunity to reorganize the party. Some of the leaders of the oil rich countries of the Middile East due to their personal relation with Zia extended not only financial assistance but helped her in many ways. They also conveyed to Gen. Ershad not to be unjust, oppressive and unduely coercive to Gen. Zia’s party. Bangladesh economy to a great extent id dependent on these oil rich Gulf states so, reluctantly Gen. Ershad had to exceed to their sermons. Gradually, Gen. Ershad had to release party accounts as well. Even after all these Gen. Ershad was assured by India that in the forth coming both in the Presidential and Parliamentary elections Gen. Ershad would certainly win with all out support and active co-operation of Awami League. In no way Khaleda Zia would be able to get her house in order within such a short time to face Gen Ershad and Awami League. Even then Gen. Ershad was not sure whether he would be able to retain his power! The reason being, abortive coup det’at of Gen Manjur, taking the advantage of the death of President Zia hanging of selective 18 senior freedom fighter officers in a heist holding a camera trial inside the Jail and cold blooded murder of Gen. Manjur in custody with out any trial had generated adverse reaction and fuming anger which was gradually cristelizing among the armed forces and the people. This was the main head ache for Gen. Ershad being a repatriated officer. That is why he needed the support of freedom fighter officers like us. As he failed to get any encourraging response from me he made a cunning move. He got in touch with Col. Rashid and Col. Faruk directly and threw a bate towards them. He told them if Col. faruk agrees to participate in the up comming Presidential election then he would allow the exiled leaders of August revolution to come back to form their own party in the national politics and to participate in the general election but with one condition, untill the Presidential election is held Col. Dalim, Col. Pasha, Col. Shahriar and Col. Nur would not return to the country. They would certainly be allowed to return only after the election. The bate was gulped by the two brother in laws. The reason was both of them had by then realized that with only money power and just being one of the leaders of August revolution would not provide them the scope to find a place in the leadership of PRAGASH. Here, who would become the leader at what level and shall hold which post would be decided strictly on marit and through the process of demiocratic centralism. In an ideology based party like PRAGASH, no such provision existed in the party manifesto that personal influence, ancestral aristrocasy, social standing or mony power would be the criteria to evaluate the leaders and workers.